HomeBlogOffice 365Here’s how office 365 crawls to improve search efficiency? 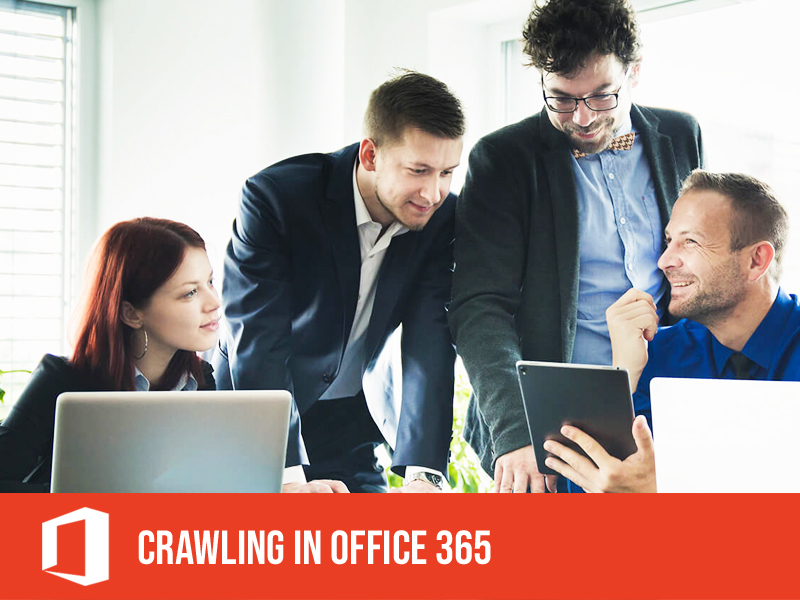 Here’s how office 365 crawls to improve search efficiency? At present cloud plays a major role in organizations and all want to move towards cloud. This has led to some confusion around management and improvement of search. When this was communicated with the customers, regarding the continued need for a search strategy, then somebody asks, “doesn’t the Microsoft Graph develop everything? Why do I still worry about search? Search is one of the critical points in SharePoint, it may be either in online or on-premises. One should always ensure the content is properly tagged classified and indexed. The content can be found only if it’s properly crawled and indexed. SharePoint Online (Office 365) and SharePoint on-premise has key differences in how content is crawled and indexed. The given content source is securely connected by the crawler and mapped to the content from the source system to the crawled properties of the search engine, and finally feeds the engine in either a full crawl or associate in an incremental crawl (which finds any changes). Search index helps you to see the results in the content search web part or the search results web part, this doesn’t come directly from your lists and libraries. One wants to change managed properties or add new ones, the changes reflects only after the content has been re-crawled, in addition crawling in SharePoint Online happens automatically based on the defined crawl schedule. The search index will not automatically re-crawl the list or the library, because your changes are made in the search schema, and not to the actual site. You can explicitly re-index a list or library to make sure that the changes are crawled, this leads to the list or library content which will be re-crawled and gives the option of start using your new managed properties in queries, query rules, and display templates. The breadth of connectors, coverage of different security models and data types capture the content and it makes them different from one search engine to the next, which enhance the performance (both throughput and latency), the robustness, and the ease of administration. Now we will find an illustration for SharePoint 2016 supports multiple crawl components, crawl databases, and content sources. In your SharePoint on-premise environment, the type or frequency of crawls can by controlled by the administrators, whereas within SharePoint Online, there is an automated schedule that cannot be changed. The frequency of these crawls, which typically runs every 4 to 8 hours from the previous incremental crawl and it is managed by Microsoft. The option which contains information from all documents and pages on your site is search index and the managed properties are kept in the index, which results, the users can perform search only on managed properties. Crawled properties should be mapped to managed properties to get the content and metadata from the documents into the search index. The administrators can re-index a site, a document library in SharePoint, or a list within SharePoint Online and this remotely-controlled crawl becomes a concern when you’ve mapped a crawled property to a managed property, and want the managed property updated to reflect this change. Whereas in an on-premises SharePoint development environment, you can initiate a full-crawl to capture the change and re-index your environment. However, with SharePoint Online, there is no choice to re-index, rather, you’ll need to open a support ticket with Microsoft to re-index your tenant. Customizing the search experience can have a direct impact on end user adoption. The search schema controls what you can search for, how you search, and how you present the results on your website or intranet. Search “discovers” info by crawling items on your website. The discovered content and metadata are referred to as “properties” of the item. The search schema features a list of crawled properties that helps the crawler decide what content and metadata to extract. By ever-changing the search schema, you’ll be able to customize the search expertise in SharePoint Online. Why would you want to change your search schema? So that you can provide a search expertise that best matches your exclusive organizational requirements. Helps your end users find the data they’re looking for more easily. To give an illustration, you might modify your schema to sort search results based on Managed Metadata columns that are exclusively for your organization, such as prioritizing results based on Product Type or Template. To give added information on On-Premise VS Online search, Office 365 and SharePoint Online can require a major shift in how you manage not just search, but all aspects of your SharePoint environment. Many features of SharePoint central administration have been streamlined, and many granular controls have been removed. Also check previous post: Why OneNote is the ultimate note-taking tool?